We hope you’ve had an amazing summer and stayed up to date on the blog to see all of our travels.. Now that summer is depressingly over and you have to start prepping for those minus temperatures - we’ve made your job easier and rounded up our skincare regime for the upcoming months. First things first, we used the Dr Roebuck’s Bryon 2-in-1 Mask & Scrub. Ensure you use this after you have removed all of your make-up. Apply a small amount to your hands and exfoliate that face using some water. Buy here at SpaceNK for only £25! Trust us it’s worth it. After scrubbing away those dead skin cells and unclogging those pores, there’s nothing better to use on your skin other than a face mask. Our favourite right now is the Umbrian Clay Mask from Fresh. Apply this mask all over your face avoiding your eye and mouth area. It also comes with the cutest little mask spoon for easy application. The texture feels like mud and makes your skin feel cool and refreshed. You can instantly feel the difference to your skin. ✶Sandalwood oil is known for its astringent properties and helps to calm the skin. ✶Chamomile flower and lavender water are notable for their soothing properties. ✶Proven to significantly reduce the appearance of pores and mattify the skin without drying out the complexion. Buy this here for only £49.00 - your skin will love you forever! 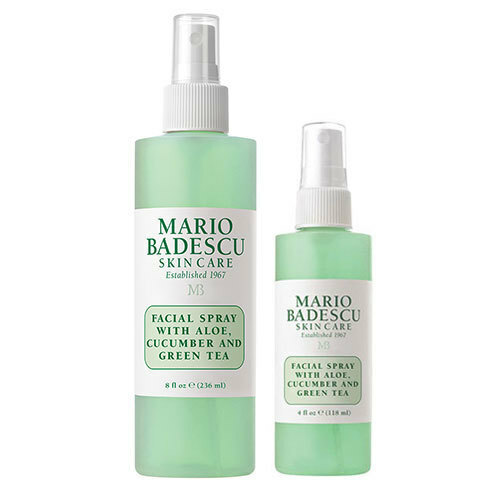 After removing the face mask and feeling immediately refreshed and hydrated, we used the Mario Badescu Aloe Vera, Cucumber & Green Tea. This is a cooling face mist and leaves your skin feeling even more fresh and hydrated. You can use this before and after makeup as it has a slightly dewy, radiant effect. Keep in the fridge for an extra bit of cool! A brand we absolutely love love love is Révive. It is a brand that honestly ticks all of your skin’s boxes, and it actually works. One of our favourites to use is the Balancing Toner which really does keep your skin in good condition. It cleanses, rebalances, tones and refreshes the skin morning and night. Use this after you have fully cleansed your skin, or like us, just finished your face mask. WE ♥♥ THIS product and you need to buy it here before it sells out! £45.00 is a bargain compared to how it makes your skin! After toning your skin there is nothing better than using a brightening serum to really illuminate before you put all that makeup on for the day. Especially when using makeup every day it is so important that you look after your skin. One of our favourite brightening serums is this Fresh Peony Instant Brightening Serum at £58.00 from Harrods. It is clinically proven for brightening effect and works it’s magic balancing out your skin. Derived from peony and liquorice root extracts, the silky, hydrating formula instantly illuminates with light-reflecting pearls and visibly reduces the appearance of imperfections. Hyaluronic acid works to attract and seal in moisture for supple skin, while white lily flower extract helps to tone, comfort and moisturise. Do not forget to moisturize your skin after all of these stages. One of our favourite moisturizers on the market right now is this Tata Harper Clarifying Moisturizer. We do use other products such as The Ordinary but once we bought this one we don’t think we’re going back. The smell is amazing and has a smooth smooth texture. It gently clarifies, creating a clearer, smoother complexion. Specially formulated for blemish-prone and oily skin, it boosts moisture levels and works to remove impurities and congestion from the surface. It is 100% free from and contains only natural ingredients which is the first thing we look for when picking our beauty products. Apply 2-3 pumps to your skin to see immediate effects! Buy here - although the price tag is pretty high at £96.00 - we literally promise you it’s worth every pump. After paying your skin full attention, you can’t forget those lips especially as the months get colder. Our lips are very prone to dryness due to all the turmoil we put them through - but we have literally found a solution. Our go-to lip balm is this Lanolip original balm, especially because its 100% natural and it is not only a lip balm but a multi purpose balm. The versatile, super dense balm has a range of 101 uses; it can be used to treat extremely chapped lips, dry cuticles and itchy skin, or to moisturise dry nasal passages, brittle nails and insect bites. Not to mention how good it smells.. Buy it here for only £9.00 as a staple for your winter handbag this upcoming winter. Well guys, there was our 7 stages of skin regime, but we’re not finished yet! See our step-by step guide on all of these products in the video below! !